Apple's official Support app for iPhone and iPad is now available to download in 22 regions, some additions this week being France, Germany, Spain, and the United Kingdom. Available free through the App Store, the app is meant to simplify accessing Apple's support system, providing quick links to chat, phone, and email as well as tools for scheduling appointments with a Genius Bar or other service providers. 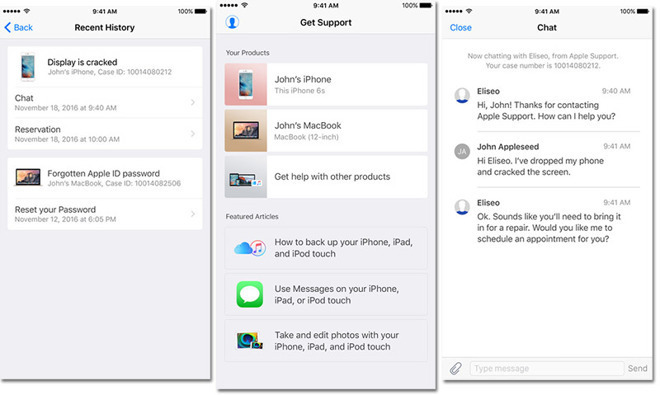 It also identifies devices associated with an Apple ID, and displays guides for common tasks and issues. Unusually, Apple first launched the app in the Netherlands in November, only bringing it to the U.S. the following month alongside Turkey and Sweden. Apple normally prioritizes the U.S. with app, service, and device launches. The company may have picked a smaller intro market to limit fallout from any problems. The U.S. is Apple's biggest individual market, and a faulty support app could have created major headaches there. Apple promised a global expansion shortly after the U.S. came onboard. The full region list includes Australia, Belgium, Brazil, Canada, France, Germany, Hong Kong, Ireland, Italy, Japan, Liechtenstein, Macau, Mexico, Netherlands, Singapore, Spain, Sweden, Switzerland, Turkey, United Arab Emirates, United Kingdom, and the United States. This post is over year old.....please do not dig-up old posts just to increase your post count.